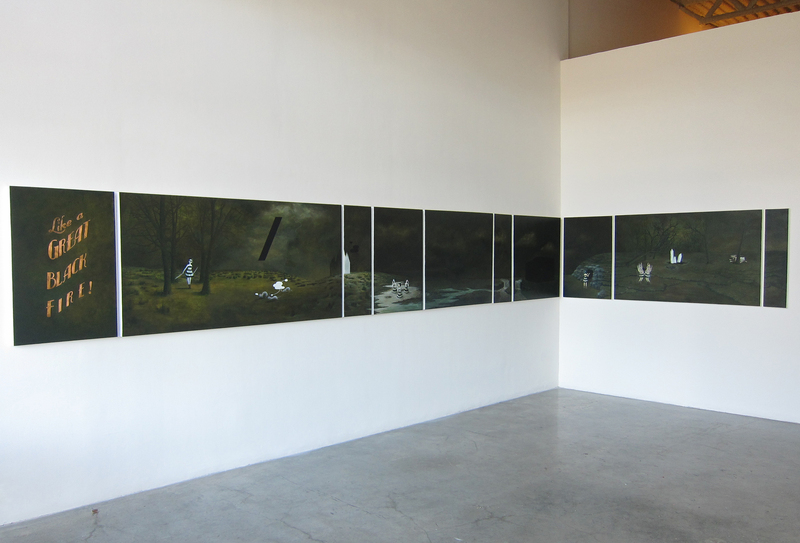 The paintings in the exhibition are arranged on the gallery wall much like a pictorial story book. The very composition of the images within the gallery space directly implies a narrative that can be read in a linear fashion: the first painting in the series prefaces the rest, featuring the name of Chaperon’s narrative across the canvas in a font reminiscent of art nouveau film posters. Each subsequent image depicts a tableau of sorts, some featuring recurring motifs and characters engaged in obscure activities, others depicting only a dark landscape devoid of any subject at all. Though the works are interconnected, they are also distinct images that could be displayed on their own terms. The size, composition, and content of each image moves from one to the next. They variously include elements that are objective and abstract, surrealistic, and naturalistic. The sum result is a body of unique work that is both synergistic and diverse in the extent of its breadth, although some pieces (such as the one featured on the Preview cover) stand out due to their visual balance, careful composition, and comparably higher detail. But what about the narrative itself? Broadly speaking, Like a Great Black Fire seems like an illustration of a perverse parable, an inscrutable meditation on the mechanics of a universe that is governed by a series of intangible doctrines. It is an oppressive space, rife with rituals and circumstances that are esoteric and illusive in their nature; there is a palpable sense of silence, evinced by the dulled exoticism of these circumstances and the creatures that pervade them. It is as if the very atmosphere of Chaperon’s world has been muffled. The tone of these images, then, evokes a kind of purgatory – populated by a consort of unsettling, cartoon-like female figures, suspended in a state of ambiguous discomfort. Interspersed throughout the visual space are abstract geometric shapes that threaten the linearity of Chaperon’s narrative. They interject into the composition, further subverting any sense of rational comprehension while conveying a macabre transcendentalism—a destruction of the material and visual borders which Chaperon has imposed on the narrative. None of these motifs would be anywhere near as compelling were it not for Chaperon’s technical ability. Although some areas are relatively rough, her figures are generally modelled with a form, depth, and sharpness that lend them a realistic quality rarely seen in the work of contemporary painters in Vancouver. 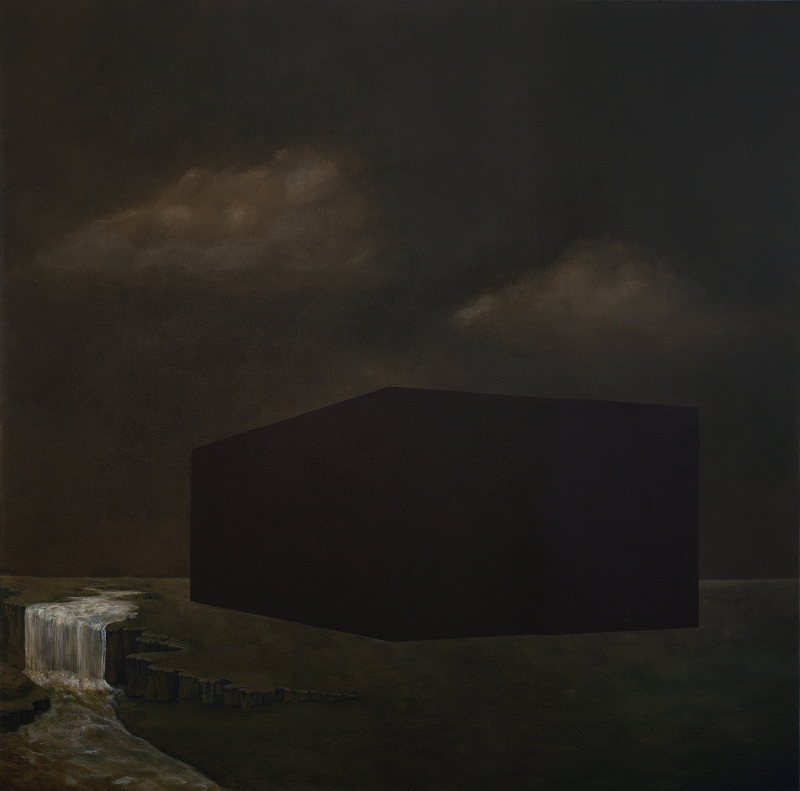 The artist’s selective use of pastel hues within a landscape of foreboding sepia and monochrome, combined with flat, non-representational space, creates a distinct visual rhythm that’s almost like being in a state of sleepwalking through space. Like a Great Black Fire is a quiet tale about a series of events that occupies a subconscious realm—a space with which I felt strangely familiar, and, I suspect, you will as well. Like a Great Black Fire is on display at Grunt Gallery, #116 – 350 East 2nd Avenue, until October 18th. 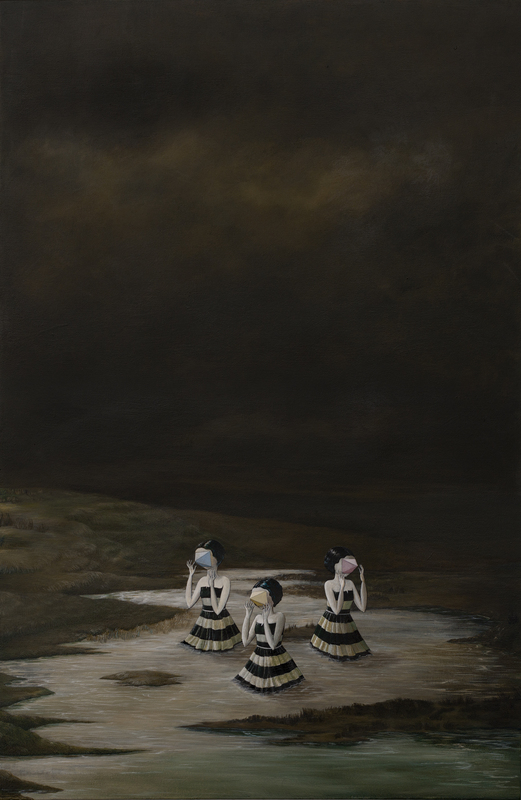 This entry was posted in Offsite Exhibitions and tagged Fairy Tale, Grunt Gallery, Painting, Preview, Rebecca Chaperon, Surrealism. Bookmark the permalink.